This post is sponsored by Blooom. Are you one of the 75% of people who worry they will not have enough money to get through retirement? Do you have fear or feel a lack of confidence when it comes to your retirement fund? Join the club. I remember when I had to set up a 401(k) at 18 years old at my job. I had no idea what I was doing. How are you supposed to know what's the best plan, how you should spread out your asset allocation, and what the fees are? Making sense of what your 401(k) options are can be confusing, this is where Blooom comes in. Blooom's job is to pick the best funds for your 401(k) and take off all the stress off your shoulders and simplifying the process. Access to a financial advisor with Blooom's paid plan. You can ask any financial questions (even beyond your 401(k)!). Actively monitors and manages your investments to match your retirement goals. Bloom is a fiduciary, which means they are legally bound to put your best interest first. As of this writing, Blooom has estimated to save their clients over $1,000,000,000 in lifetime investment fees*. You do not need to move your 401(k) account. User-friendly software makes it easy to see at a glance your 401(k) plan. 1) Blooom looks at your 401(k) fund options and eliminates funds that don't make sense for your unique retirement goals. Blooom shoots for index funds or lower-fees funds to get you close to your target allocation. 2) Blooom's algorithm selects ideal investments. 3) Blooom actively manages and watches your accounts until it's time for another scheduled rebalance. Once your 401(k) account is connected, Blooom begins the process of analyzing your accounts. You'll see where you may be paying excessive investment fees. Then, you'll see your current asset allocation and where you can make changes. Blooom will ask you some basic questions about your retirement goals and what age you want to retire. Blooom uses your answers to recommend a mix of funds available for your 401(k) plan. On top of that, Blooom will actively observe and examine your portfolio’s asset allocation. Bloom will keep you on track with your goals by adjusting your investment choices as you near retirement. Blooom's free 401(k) analysis will be unique to you based on a few factors, such as age, how many years you have left until retirement, and your tolerance for risk. 401(k) Analysis – Free – The 401(k) analysis includes an easy-to-read review of hidden investment fees in your investment plan, recommendations for your portfolio, and if your plan is diversified and invested in the right mix of funds for your situation. Management & Monitoring- as low as $10/month –Everything included in the free 401(k) analysis and management of your 401(k) plan for a low flat fee . Discount is offered if you pay in full annually. Refer A Friend – Once you sign up for Blooom, you can refer friends and get $10 for every friend who takes Blooom's free 401(k) analysis. Blooom exposes hidden investment management fees that are lurking in your 401(k). Many of us don't even realize how much we're paying in fees because they're automatically deducted from our accounts every quarter or year. Blooom makes the hidden fees easily visible and directs you to the lowest cost funds available in your 401(k) plan, while meeting your investment objectives. People have enough going on in their lives without having to worry about their retirement funds. With Blooom, you can be confident in your 401(k). Getting your portfolio right can be a game changer on the long-term growth of your retirement plan, and Blooom can help get you there. You might not know it, but you're in charge of managing your 401(k), not the company you work for. Blooom takes all of your funds and retirement goals and rebalances your portfolio as needed. This is ideal because if your retirement goals change or if your employer stops offering a certain fund, Blooom can help get you on track. Blooom will develop a plan and do the heavy lifting for your retirement goal success. When the market goes up and down, Blooom will let you know your options and keep you calm during the storm. You can ask an advisor about your finances, even if it has nothing to do with your retirement fund. You can chat with an advisor via email or support chat. Blooom adds an extra layer of security by continuously monitoring your 401(k) for any suspicious activity or withdrawals. If at any time Blooom suspects strange activity, you will receive an alert via text message or email. Does my 401(k) account need to move to Blooom? No. Blooom can work with any account as long as it has online access. You may think this is true, but when you signed up with your 401(k) company, you told them what percentage to invest and where. They simply implement what you’ve told them, whether it's good or bad. Whaaaaaat?! I know. Yep! This means that Blooom is required by law to act in your best interest, not theirs. You may be surprised to find out that not all advisors are required by law to act in your best interest. It was a shocker to me, too. How long does it take Blooom to make changes to my 401k? Usually 10 days, but never more than 30 days. 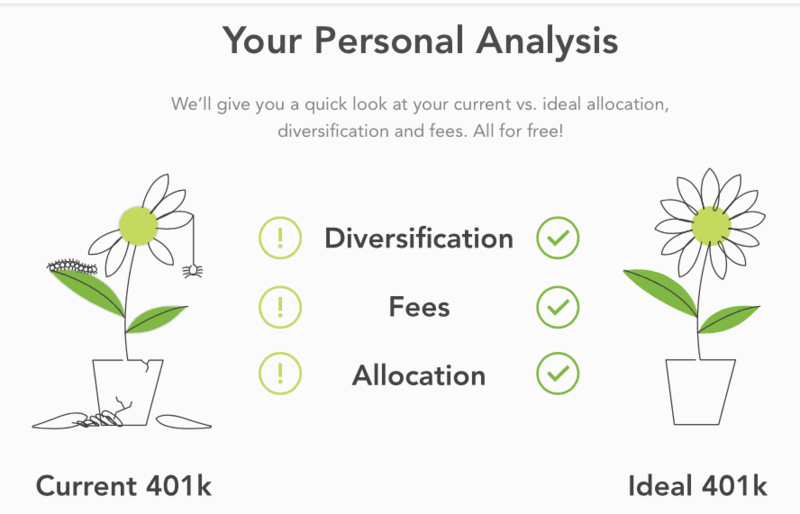 Blooom's free 401(k) tool is definitely worth checking out. With the free 401(k) analysis, you'll find out if your plan is diversified, invested in the right mix of funds, and if you're overpaying in investment fees. It only takes 5 minutes to link your existing 401(k), then Blooom will research all available funds in your 401(k) and put you in a portfolio that will help you reach your retirement goals. So, what are you waiting for? Get started with a 401(k) plan that you're confident will give you the retirement you deserve. Investing involves risk. Your investments are subject to loss of principal and are not guaranteed. Blooom relies on the ability to receive updated account and transaction information. Blooom is limited to the funds available in your employer-sponsored retirement plan. There is no guarantee blooom can or will reduce your fund expenses. We do not guarantee we will be able to provide account monitoring to all accounts. *Lifetime Investment Fee Savings projection based on median blooom client data including 401k balances of $49,805 assuming $5,000 annual contribution, median pre-blooom investment expense ratio of 0.47%, median post-blooom investment expense ratio of 0.19%, an allocation mix of 96% stocks with a 7% gross annual return and 4% bonds with a 3% gross annual return, 27 years until retirement and the number of active blooom clients. All median data as of August 5, 2018.